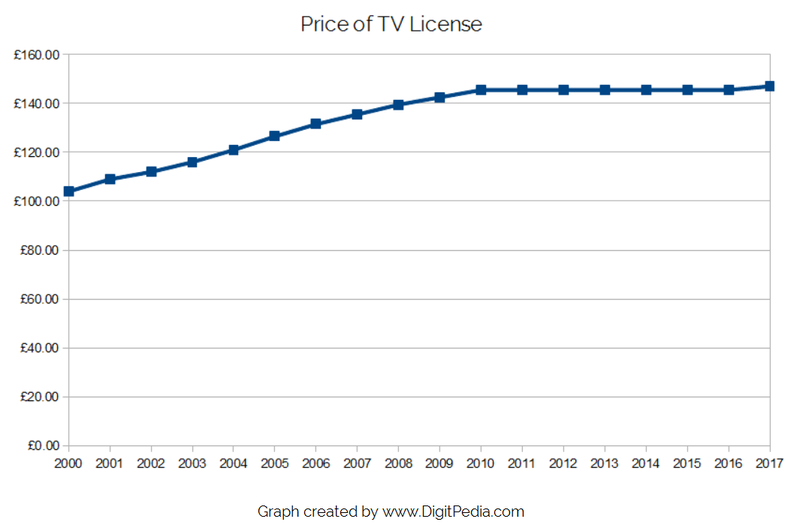 The British Government has announced the cost of your TV license is going up, by £1.50. From April 2017 the price to pay will be £147, previously it was £145.50. This is the first time there has been a price rise since 2010. As you can see from this graph, there had been steady rises throughout the noughties, and then in recent years it’s stayed the same. For the lovers of nostalgia, the price for a black and white license will be £49.50, that is a rise of 50p. If you are aged 75 or over then your license remains free. Remember you can spread the cost if you need to. Using direct debit you are allowed to pay monthly, quarterly, or yearly. Alternatively you can pay online or on the phone using a debit card. If you don’t have the cash right now then credit cards are also allowed. Don’t think they won’t catch you if you decide not to pay but still keep watching. Have a look at this statistic from the TV License website. 900 people a day being caught is a lot. It’s not worth the hassle and then having to pay the fine. Either pay for it, or declare you don’t need one. If you don’t want to pay the fee, then you don’t actually have to. Obviously it will mean missing out on some programs though. But it doesn’t have to actually mean getting rid of the television altogether. Legally you can still watch on-demand services, such as the ITV Player, All4 and Sky Go. Plus on-demand movies from services like Netflix and Amazon Instant Video. YouTube is also fine, so all-in-all your smart TV could still see plenty of action. iPlayer wouldn’t be viewable though. To put it simply; without a license you are not allowed to watch or record any live TV on any device. As you’ve seen from what I listed above, you can actually still see most things though thanks to the catchup services! If you decide to go this route then be sure to declare it so they don’t come round with a fine for you to pay. Here is the link to declare your decision. Without having live broadcasting to watch you may also find time for things like reading, cookie, working out or whatever other hobbies you have. Thanks to the on-demand services, the idea of not having a license is a realistic prospect now for some people, if that’s you, have a think about it before you have to renew.